Intake pipes, ventilation parts and containers for brake fluid or windscreen wiper water in cars have to withstand pressure. These pipes and containers are often injection molded as plastic half shells before being welded together to form the finished product. Infrared heating technology helps to join the parts securely together without creating particles in the insides of the tubes. 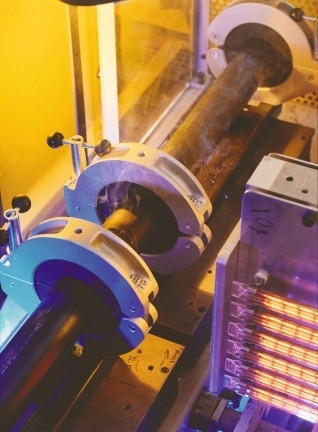 In many cases, a combination of infrared pre-heating and vibration welding can prove particularly advantageous. The infrared radiation melts the plastic surface so that particle formation is minimized during the vibration process. This creates a more secure joint and a flawless container. Heraeus Noblelight will be showing application-optimized infrared emitters for plastics processing on Stand 1121, Hall B1 at Fakuma, which takes place in Friedrichshafen from 16 to 20 October. Injection molded pressure tubes are used in radiators or in turbo motors and containers for water or brake fluid. Welding seams must withstand pressure and whether in the turbo or in the brake fluid, plastic particles created during production will disrupt the component function. Infrared radiation is transferred without contact and generates heat directly in the work piece. As a result it is superior to conventional methods such as heating by contact plates. Also unlike welding with contact heat, infrared heating leaves no hot plastic on the heating source. Consequently, plastic parts can be welded reproducibly in seconds. Infrared radiation melts the target surfaces in a targeted manner in a matter of seconds and these can then be joined by simply pressing them together. According to the type of plastic, large particles can be created during vibration welding and these can find their way subsequently into cooling water, servo oil or brake fluid, with adverse effect on function. It can also be uncomfortable for a driver to have particles blown into the inside of the car through the air ducting. A combination of infrared emitters with vibration welders provides a practical remedy to the problem. An infrared module passes between two plastic parts and heats the surfaces of both parts without contact. When the specified temperature is achieved, the infrared module is removed and the actual welding process begins. Tests carried out with users have shown that the seams welded with the aid of infrared radiation are able to withstand very high pressure. • Short wave emitters and Carbon infrared emitters respond to control commands within seconds. As a result, the correct intensity and duration of the radiation can be selected to melt different plastics. • Filler materials have influence on the welding result. Mineral fillers in plastics provide fire-resistance and reinforcement with glass fibers improves the pressure stability of containers. Unfortunately, the higher the filler content, the harder are the plastics to weld. Fire-retarding materials melt with difficulty and a glass fiber content greater than 35% can make the welding process almost impossible. Unlike contact plates, infrared emitters cannot be damaged by glass fibers, as heating is contact-free. • Black plastics absorb infrared radiation generally better than white or transparent plastics. Test have shown that half shells of polyamide, which are joined together to create a hollow body, reach the target temperature three times faster in black material than in light colored materials. • A real challenge is the welding of three dimensional shapes. The more complex the structure, the more difficult the complete process. Vibration welding under these conditions is completely impossible because some shapes can no longer oscillate. Infrared offers a solution here as it is possible to shape emitters three-dimensionally. • Standard surface emitters can be used for different geometries if they are matched to the plastic component by cover masks. As a result, several components can be processed simply and quickly with one surface emitter. In addition, the cover masks minimize any stray radiation into the immediate environment of the welding system. Carefully chosen infrared emitters help to provide high quality joining of plastic components for cars. As the infrared emitters need be switched on only when the heat is actually required, welding with infrared heat is also extremely energy-efficient.